The British Afternoon Tea; Where Did it All Begin & What is Served? 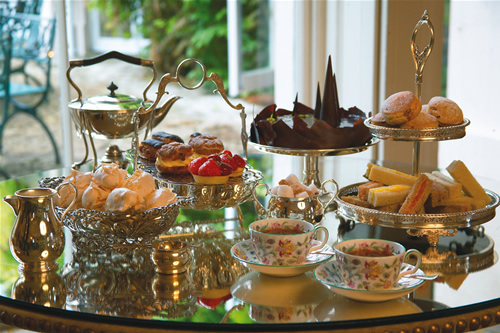 There is no more quintessential British ritual than the ceremony and serving of Afternoon tea. It is believed that credit for the custom goes to Anna, the 7th Duchess of Bedford in the early 19th century. The usual habit of serving dinner between 8 and 9 pm left the Duchess hungry and with a ‘sinking feeling’ by late afternoon. To stave off the hunger, she would order tea, bread and butter and cakes to be served in her room. Later on she would invite friends to join her at her home and the light tea was such a success the habit caught on. The Duchess continued the custom on returning to London and soon the “At Home” tea evolved which quickly spread throughout England. Announcements about tea were sent to relatives and friends stating at what hour the tea would be served. Sometimes entertainment was provided but more often it was simply conversation and a little idle gossip over tea and cakes. If “At Home” notices were received the guest was expected to attend, unless of course, regrets were sent. There was at least one person holding an at home each day and social ties were quickly established with women seeing each other so regularly. The Afternoon tea traditionally starts with savory finger-sized sandwiches filled with smoked salmon, cucumber, or egg and mustard cress. These are followed by scones with jam and cream (clotted cream in Devon and Cornwall), and finally, a selection of cakes served on tiered cake stands. Variations on the menu may include the serving of English Muffins, thinly sliced, hot buttered toast or crumpets. Alongside of course, are copious cups of tea. The tea is traditionally poured from heavy, ornate, silver teapots into delicate bone-china cups and served with milk or lemon. Now this is some kind of Tea Party! You can still get this type of tea in some places in England, notably high class London department stores, such as Fortnum and Masons, Harrods, Liberty etc. and 5 star hotels. It is not cheap, as you can imagine. As an aside: you could tell if a person was upper or lower class by when they put the milk in their cup. Due to the variation of quality of china at the time if you poured boiling tea in a cheap cup the bottom may well have fallen out. So, low class people, with cheap china, put milk in first to dull the boiling liquid. This was noted by sniffy upper-class and aspiring middle class tea drinkers, and so people were categorised accordingly. Why thank you, Kind Sir! The information you’ve provided is equally as interesting as the information on the blog itself! I had no idea tea possessed this sort of “class” Thanks for the addition! BTW looking up Fortnum and Masons high tea and Harrods, which has its own Tea Room, they are $60 and $49.50 respectively. Hi Bill! That’s a hefty sum for tea, cakes and finger sandwiches! You are a plethora of information and I, as well as our followers, would really enjoy hearing more. I would like to devote a day to your offerings. If you are interested and would be so kind, I would love to do a personal interview and offer it on the blog. Please email me for details. Thank you so much!